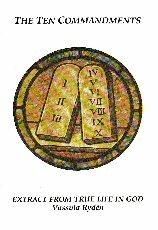 This booklet contains an extract from the TLIG messages which speak of the Ten Commandments. It will greatly help those seeking a fuller understanding of the Commandments, as revealed to Moses. First published in 1994.